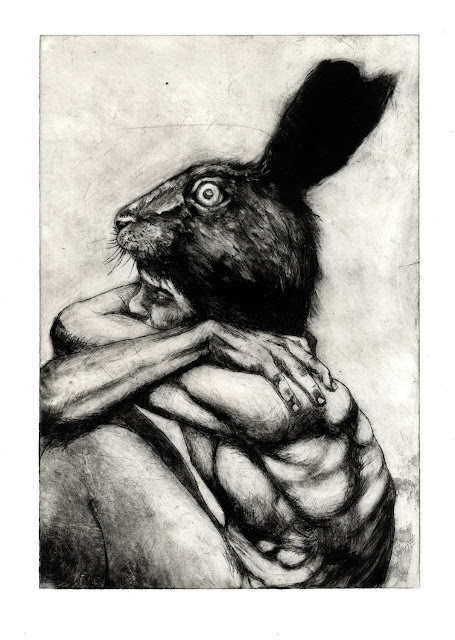 The Hare, an intaglio etching based on an original fable/fairy tale. Etched using copper plates and aquatint in a mezzotint style, each print is completed to the highest standard and printed upon 300 gsm somerset satin paper. The plate size is 210 × 297mm and paper size is 250 × 353. 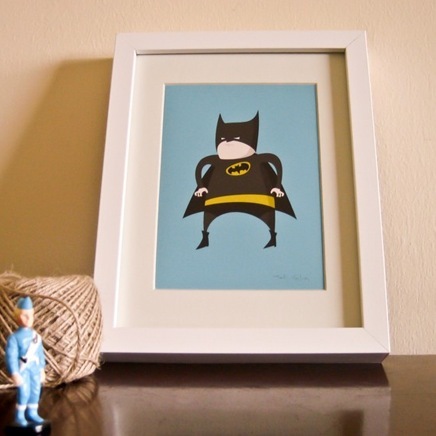 Printed as a series of 50 each print is signed and numbered by the artist. 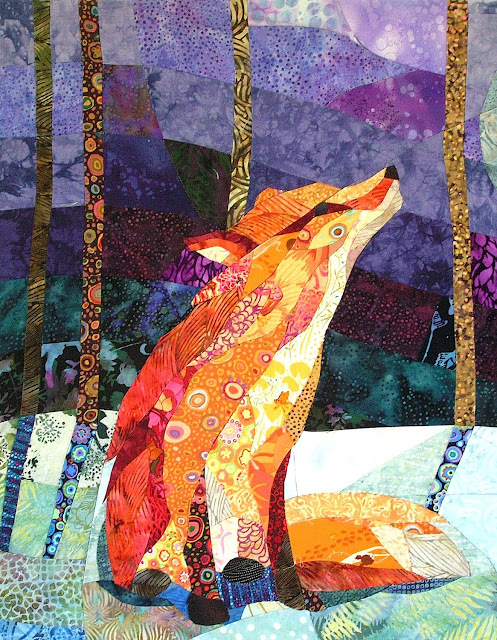 Orange Fox Purple Night is a one-of-a-kind artwork, designed and sewn from individual cotton pieces, like a quilt top and mounted on stretcher bars. It is 32 x 24". Piecing everything, rather then appliqueing, gives the design more depth and the dimensional quality of the seams are emphasized by the mounting. The overall design reads as a whole, but each fabric piece has an individual story, revealed as you move closer. The fabrics are mostly abstract batik and Kaffe Fassett prints. In the fox you will find flowers and frogs and mermaids. Beautiful! This unusual ambient lamp is inspired by nautilus and ammonite shells and made from wood veneer. One of several prototypes that Fiona made as a student, it is unique and needs a loving home. This lamp has an acrylic base and takes a low energy bulb. Approx 360mm x 300mm x 130 mm. It's made with a lovely 'fiddleback' figured red wood veneer found in a dusty box at an auction and gives a lovely ripple reminisant of a shell. Wonderful! Wow! 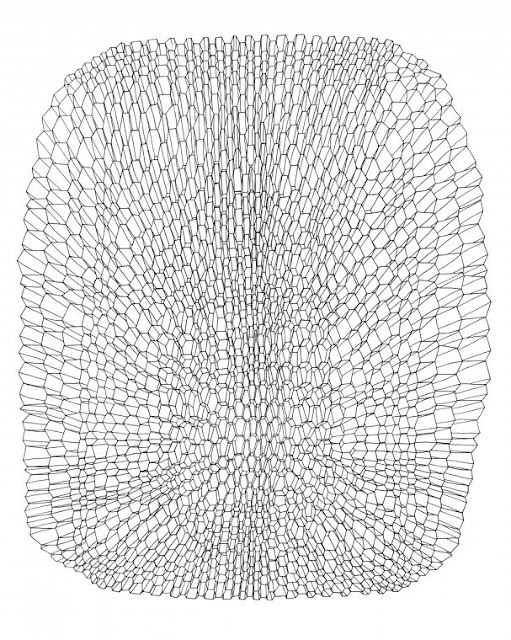 This wonderful wall piece is one of a kind and created by hand from steel wire mesh. It is made without molds or forms, and has a black powder coated finish, so it is strong, durable, and not easy to bend. This sculpture hangs on the wall using a small nail and creative use of lighting will heighten the surprisingly detailed shadow effects. 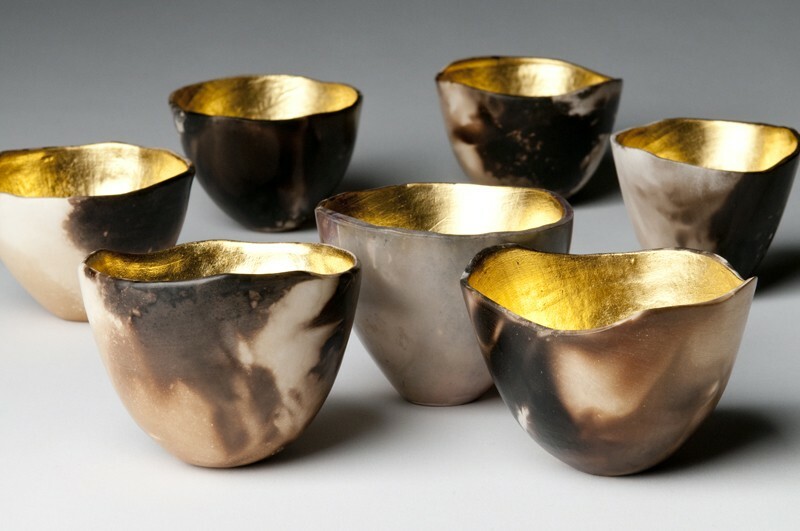 12"H X 9"W X 7"D.
These beautiful little pots of gold are smoke-fired white earthenware with a 24k gold leaf interior. 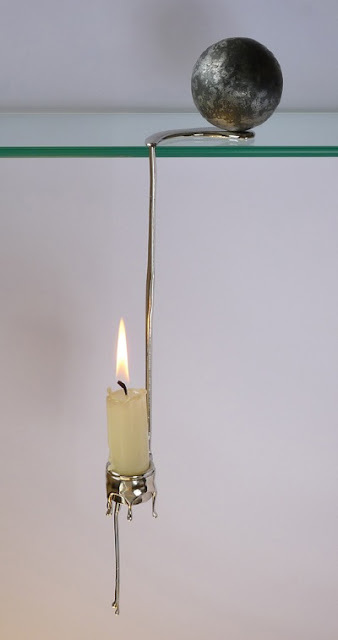 Ideal for tea light candles which make the gold really glow. Each pot of gold is hand-made and smoke-fired in a bed of sawdust and shredded paper, each one has a unique pattern and color which can never be replicated. Average height: 2-3 inches. 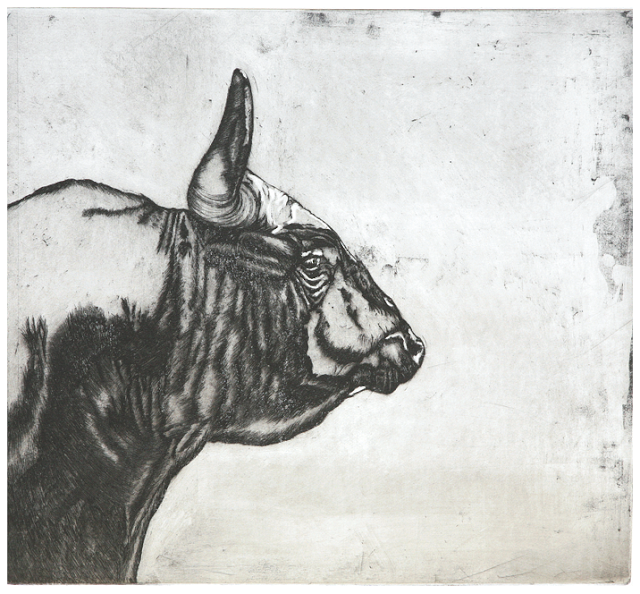 Limited edition original etching. 405mm x 405mm. In an edition of 15. Signed and dated by Guy Allen. 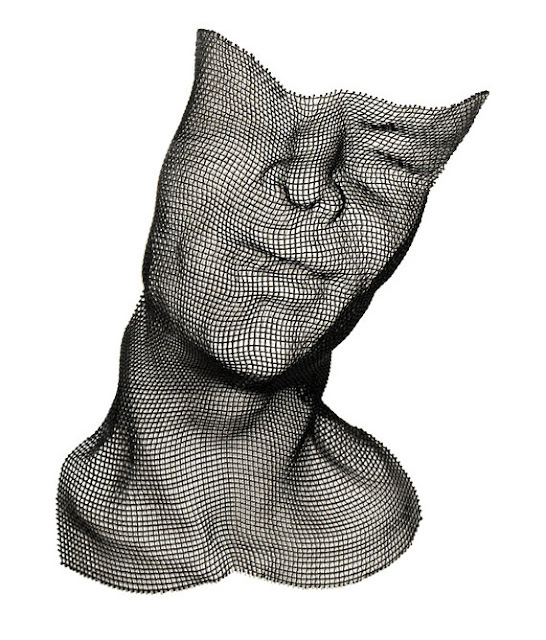 Guy graduated from Central Saint Martins School of Art with a BA honours degree in Fine Art in June 2011. 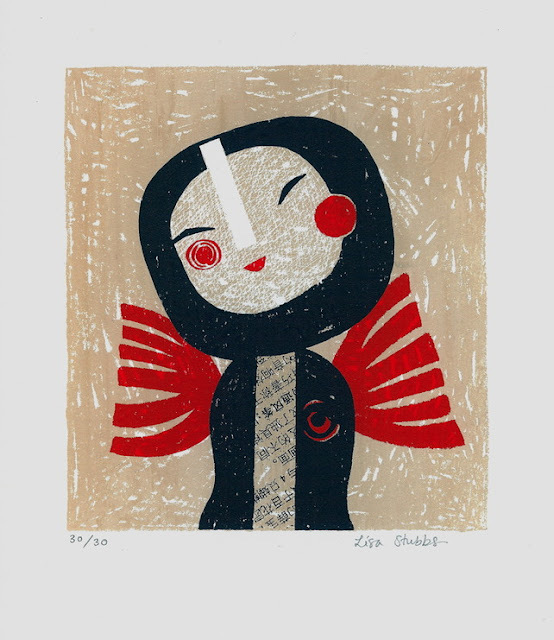 During his degree Guy studied for a term in Paris in 2010 where he discovered a passion for printmaking. 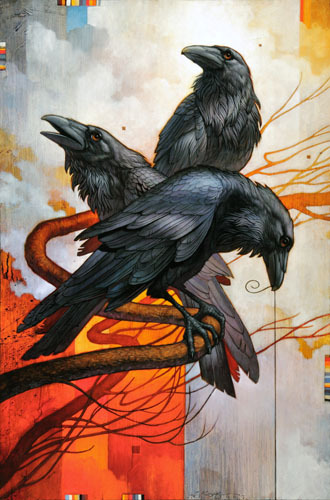 Launching his print collection at the Animal Art Fair in March 2011, Guy was one of the best selling artists at the fair and his work was featured by the Independent. This item is not just a vase, it's a unique decorative creation. Place it near a sunny window and you will see a world of colours and golden lights. It would make a beautiful piece to decorate your home or as a gift for any occasion. 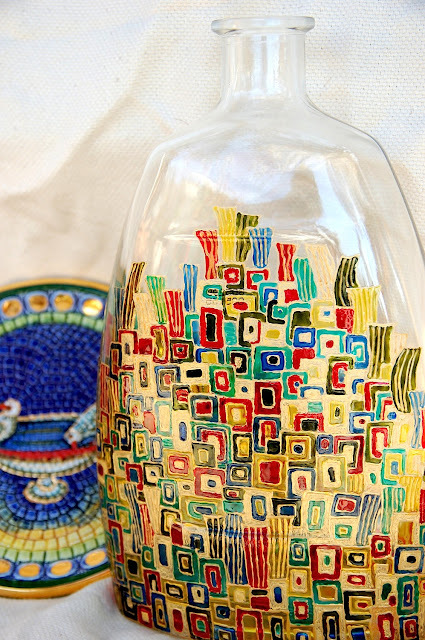 ﻿This vase is an upcycled cognac bottle, hand painted with transparent glass paints. Each bottle is unique and signed by the artist. 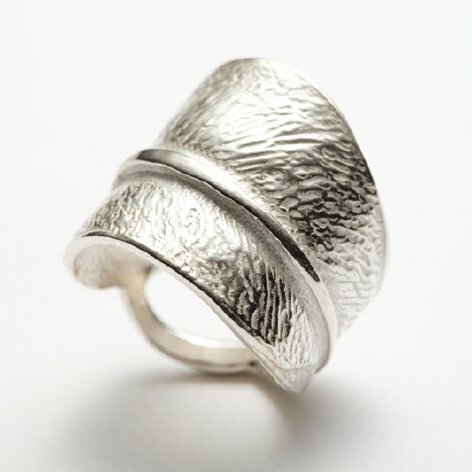 This beautiful leaf sterling silver ring has been cast, hand finished and polished. Very elegant and yet very, very simple, with a great texture and shine. It is wide and flat and super comfortable to wear due to its slim base band. Can be custom made to your size. 0.75" at the widest point. Hand printed cotton babygrow, printed with a yummy biscuit design. Soft cotton grow. Available in a variety of sizes, from 3 months to 2yrs. Fantastic! 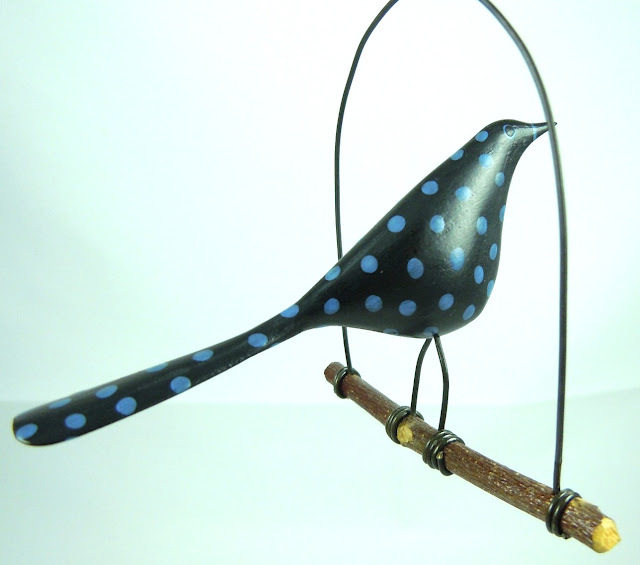 This adorable hand-carved and hand-painted black bird has cheerful blue dots. The eye and beak are rimmed in the same blue as the dots. She has a perch made from a twig and her feet and the swing are made from wire that has been carefully formed and assembled by hand. The wire hook at the top of the bird swing makes it easy for her to be a part of your home decor all year long because she will hang from just about anywhere. Dimensions: 6 inches tall to the top of the hook, 4 inches long, 3 inches wide. 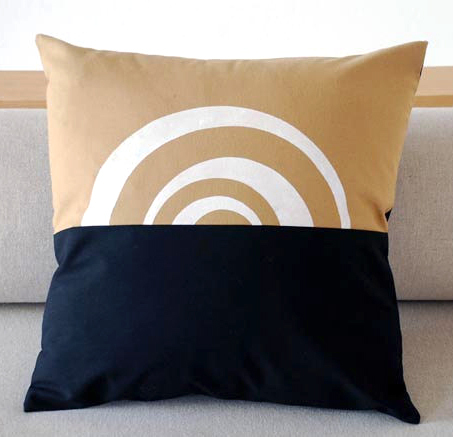 These pillow/cushion covers from Portugal based Moment Art are lovingly hand painted on anti-stain cotton fabric. 16" square, with a zipper envelope back. 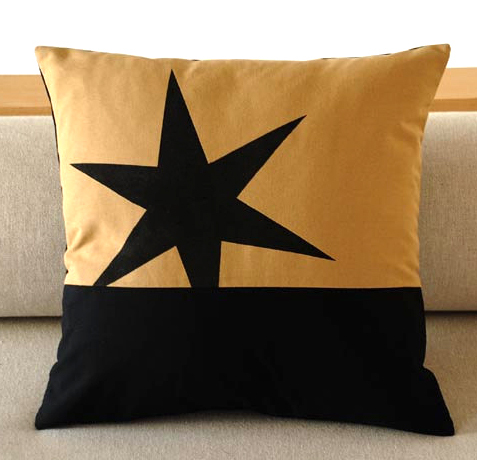 Fantastic and unique home accessories that would look great on your sofa! 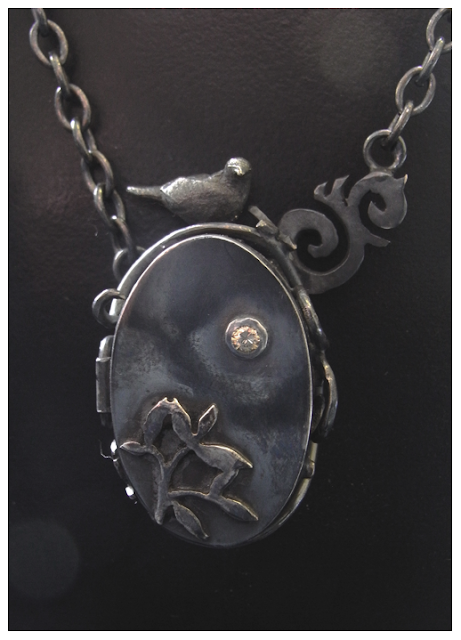 Oxidised sterling silver and diamond oval dove locket. This beautiful locket has leafy tendrils, a champagne diamond and a tiny dove perched on top, just waiting to see what's inside. the locket is approx. 35mm tall (including dove) and 20mm wide. It has intricate piercing and wire detail around the sides and is hung from oxidised chain, with a beautiful silver antique key acting as a T-bar clasp. 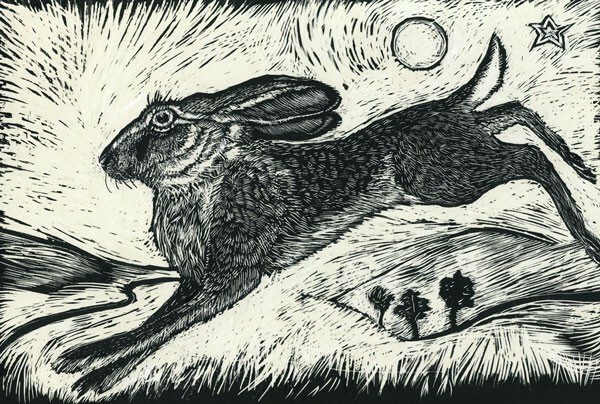 This beautiful Hare print is from an original scraperboard piece by Kay Leverton. Using scraperboard is incredibly labour intensive and each of Kay's originals take anything up to 60 hours to complete, but well worth the time invested, don't you think? This print is A4 and printed with Epson archival inks. Fantastic! 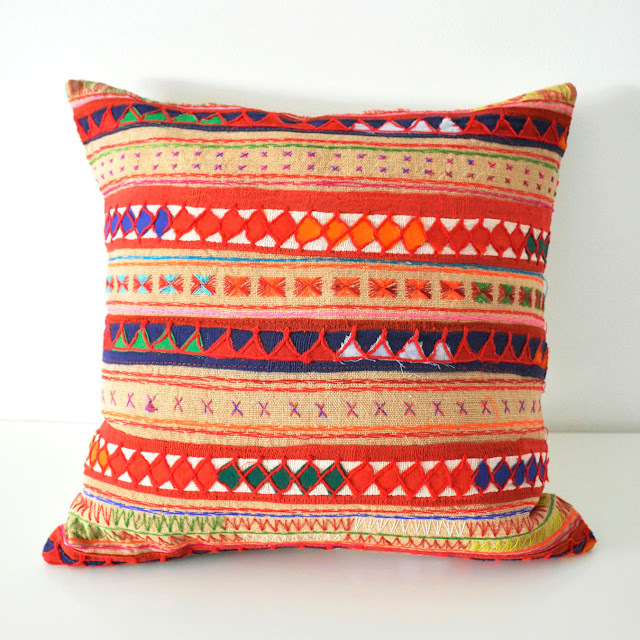 This lovely pillow cover was made from the Hmong tribal cotton fabric, which is one of a kind fabric that's found in Southeast Asia. 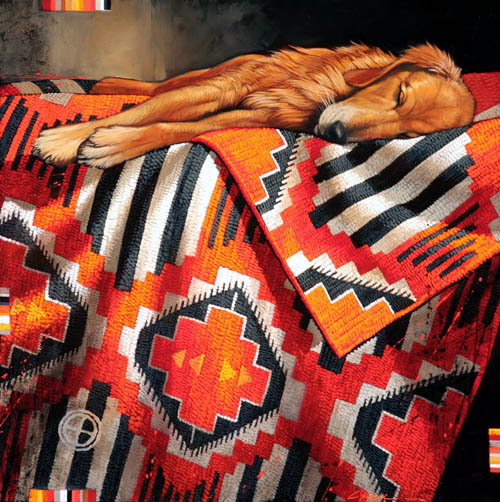 Each pillow cover has its own unique pattern and vibrant color line up on pure cotton with a solid beige cotton reverse. Size: 16 x 16 inch. 'Gratitude' 46" x 46" oil on canvas. 'Comfort' 24" x 24" oil on canvas. 'Sirens' 48" x 32" oil on canvas. Absolutely stunning work from Craig Kosak. Please click through for more images (I could have linked to everything on Craig's site). Beautiful! 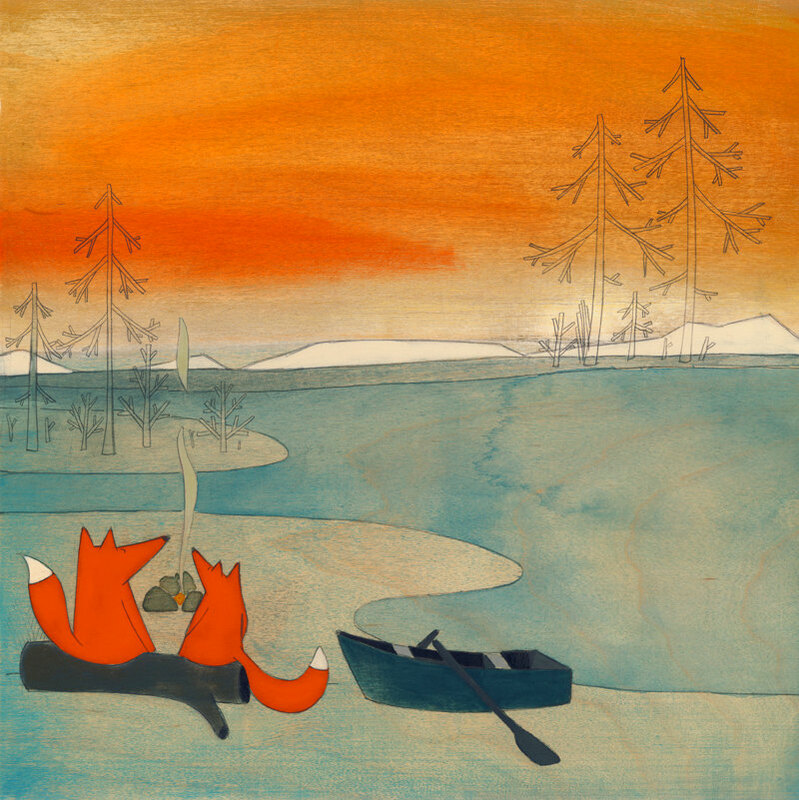 Sunrise is a print of an original pen and ink drawing. Printed on archival, heavyweight premium matte paper with archival inks. The blacks are strong and the paper is a warm, bright white. Signed by the artist. Approx 8.25"x10" (21cm x 25cm). 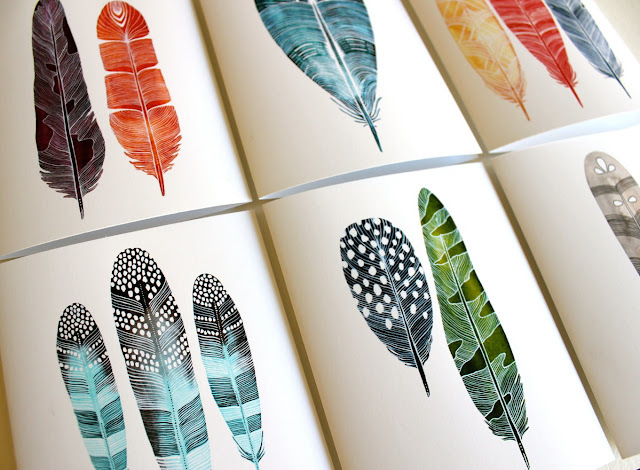 A set of 6 beautiful notecards featuring Marisa Redondo's distinctive feather illustrations. Each measures approx. 4.25" x 5.5". Blank inside for your own personal greeting. These cards are printed on fine art paper, and include white envelopes. Fantastic! 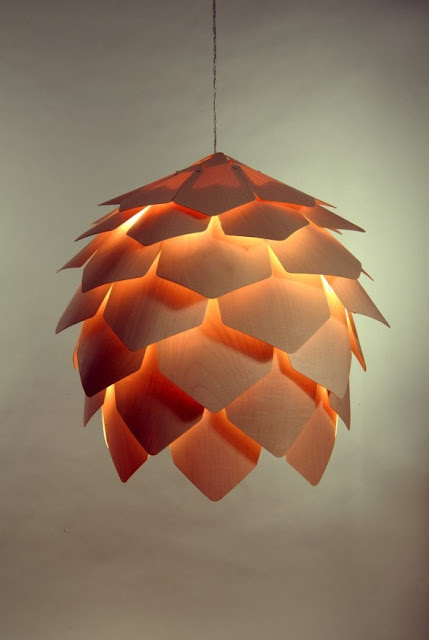 This Crimean Pinecone lampshade is made from 56 natural maple wood veneer plates and screws. 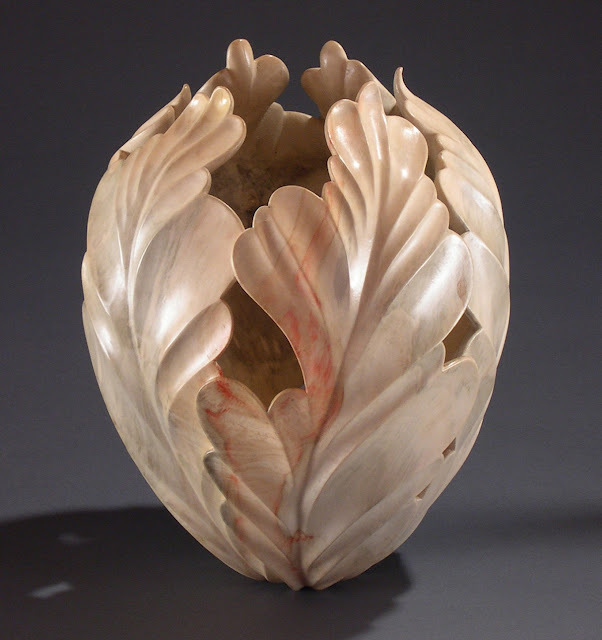 It has no internal frame and due to the rounding maple pieces, light passes through the gaps creating beautiful patterns. Size: 60cm wide x 80cm high. One-of-a-kind necklaces as unique as you are. 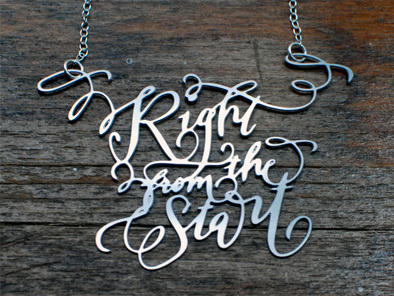 Each custom necklace is hand lettered for Brevity by calligrapher Crystal Kluge, and then etched into stainless steel. The pendant is made from stainless steel and hangs at the nape of the neck on a 15" sterling silver chain, and comes with a 2.5" extender chain. Beautiful! 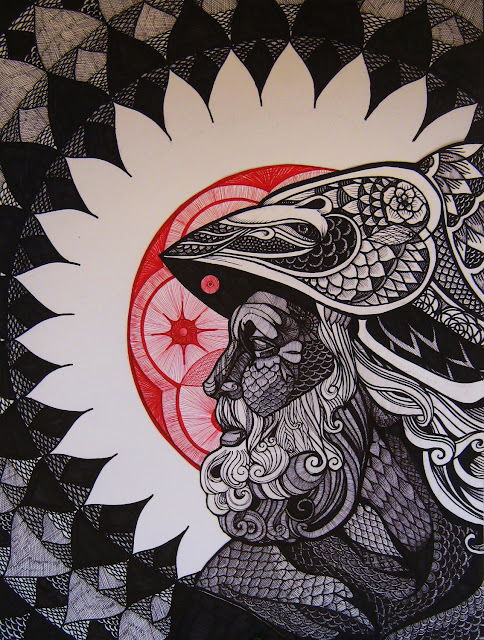 Print of an original ink drawing using Sharpie markers; "Phronesis," meaning practical wisdom in ancient Greek. 7" x 11". Printed on high quality gloss paper. All prints are signed and dated by the artist. 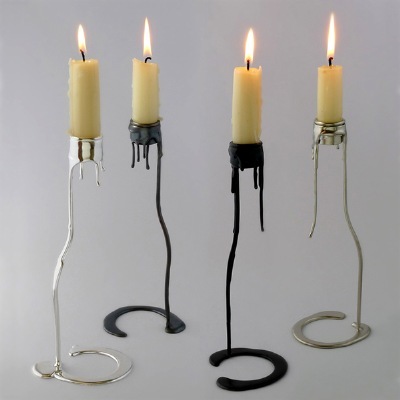 I absolutely love these candleholders from Chris Edwards. Every so often you stumble across a design that stops you and demands your attention, well this is one of those for me. I love the fluidity – very nicely done. Each 'bottle' candlestick is made individually, cast in bronze and either left in its natural state or plated in silver, nickle, black nickle or antique copper. The hanging sconce is in nickle plated bronze. There's no shop facility on Chris' site, but you can email him if you would like more info on purchasing any of his beautiful designs. Batman retired and ate too many burgers, but that doesn’t mean he can’t still wear his undies on top of his pants. This print measures 8×10" (203×254mm) and fits perfectly into a standard sized frame. It’s professionally printed with archival inks on beautiful fine art paper. The paper is matte, heavy-weight and acid-free, which means your print will last a lifetime. 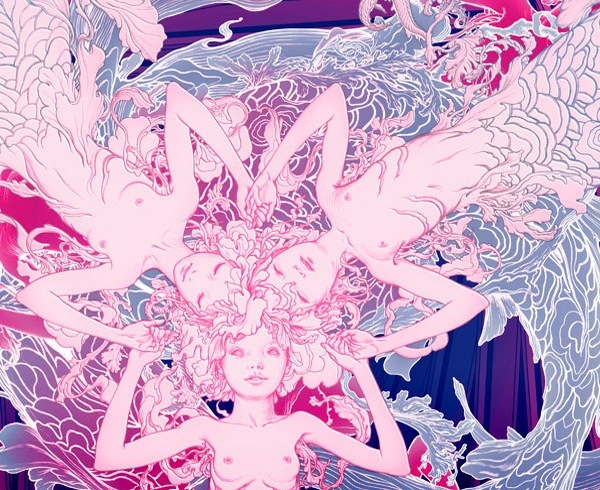 All prints are signed by the artist. 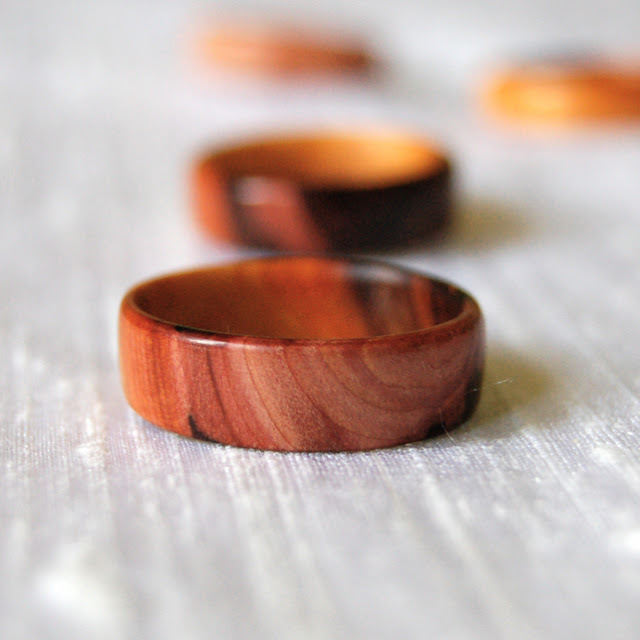 Yew has long been prized for its beauty and rarity, it's also durable, making it ideal for jewellery. This unique Yew ring has been turned from a tree that was estimated to be 800 years old (that hopefully fell of it's own accord!). The range of colours in the grain is fantastic from very dark brown, through orangey-gold and red brown to a deep pinky-mauve. After turning, the wood has been sanded silky smooth and then soaked in mineral oil to nourish the wood. It is finished with natural carnauba wax and buffed to a beautiful sheen. "Long-awaited next stop is by the lakeside just on time for a sunset". Stories is a print of an original acrylic illustration and measures 8.5" x 11". 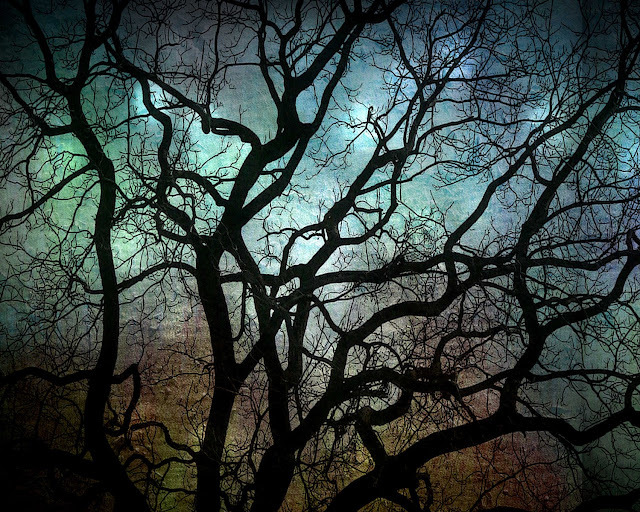 Printed on archival fine art paper with a matte finish. Each print is titled and signed by the artist. 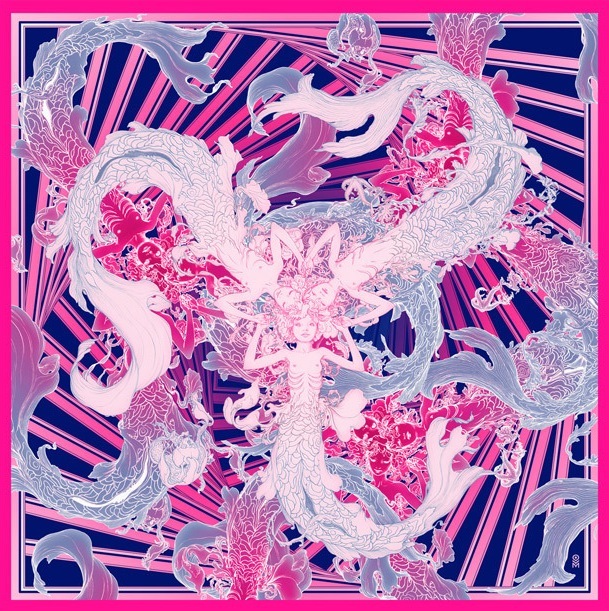 This beautiful James Jean scarf is made from 100% silk twill, it has a hand rolled hem and is 36" x 36". Limited to just 75 pieces it comes with a signed and embossed certificate. I'm totally in awe of James' amazing paintings, and love how his illustrations work on objects such as scarves, teacups and skateboards. 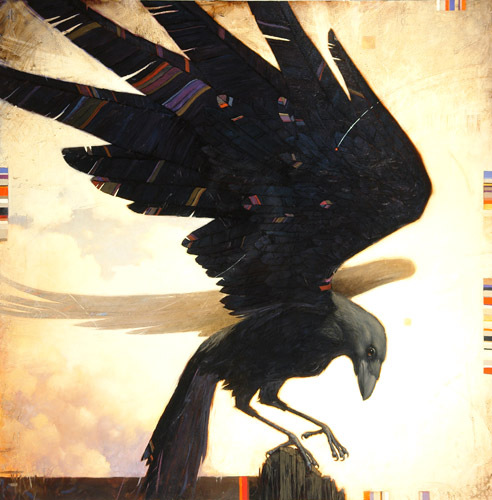 Click through to see many more beautiful pieces from James! 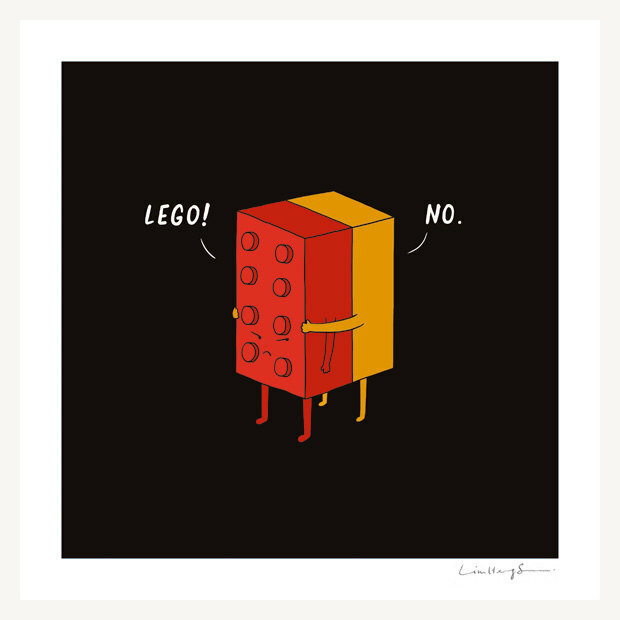 "I Will Never Lego" is a print by ILOVEDOODLE aka Lim Heng Swee, an illustrator and visual artist living and working in Kuala Lumpur, Malaysia. This fantastic giclée is printed on Somerset Enhanced 100% Cotton Fine Art Paper 225gsm and measures approx 21cm x 21cm including a white border for framing. Signed by the artist. I love it! 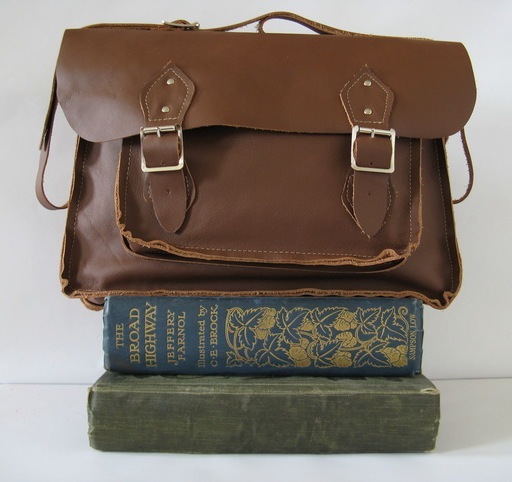 Stylish version of the old school satchel in soft leather. 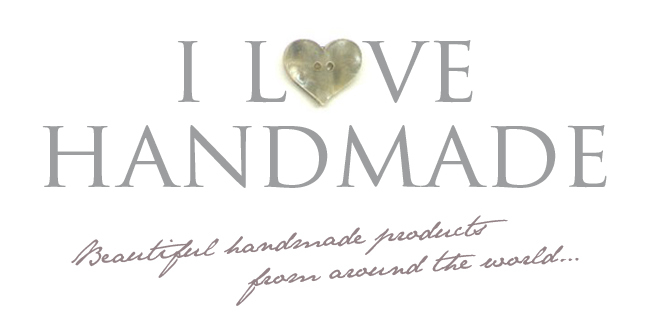 Just right for your purse / wallet and phone. One main section plus front pocket. Available in red, brown, white, black and burgundy. Approximate size 31.5cm w x 22cm h x 6cm d.
Blue Moon Over Philadelphia is a very beautiful (and affordable) 8x10" print by Moonlightphotography. I'm loving the range of colours through the bare tree branches, fantastic stuff. Printed with a state of the art printer using a beautiful archival luster 5 star paper. Signed on the reverse. Moon Flower by Ron Fleming at Hearthstone Studios. You have to admire the incredible craftmanship in this beautiful piece. Made from bleached Box Elder wood with a lacquer finish. 10" x 7 1/2". This little boat is a replica of a traditional Black Sea fishing trawler. 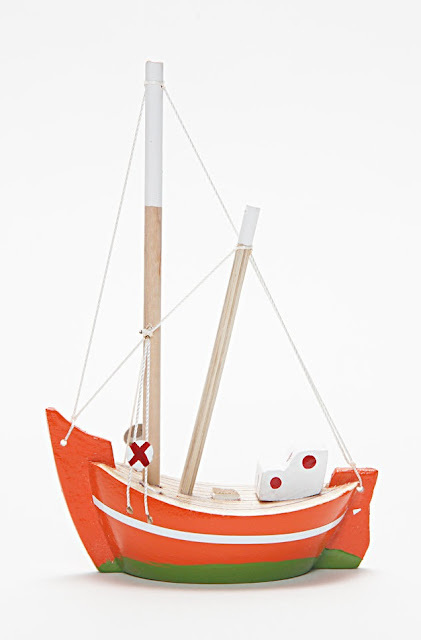 It may look very simple and cute, but it's a well crafted miniature replica model of an original trawler. All oyma's boats are handmade with care and attention to detail from canadian poplar wood and beech ply. They are hand sanded before being painted in beautiful bright colours and rigged just like the real thing. 'Free Spirit' is a beautiful original 3 colour screen print, hand printed using acrylic, paper and elbow grease. Hand squeegied, each one has a tiny imperfection to make it unique! Printed on Fabriano heavy weight white paper, numbered and signed by Lisa Stubbs. Here's Lisa to explain why this print is so special, "My story's simple and fortunately for me has a happy ending. I was diagnosed with breast cancer 21st June 2011, I put on my brave face, hard hat and hob nail boots (to kick some cancer bottom) and had a mastectomy, chemo and radiotherapy. I finished my radiotherapy at the end of January and I'm now doing great! The grass is greener and the air is sweeter. Not a day goes by where I'm not grateful to be here, for my amazing family and friends and for the truly amazing and inspirational doctors and nurses who have guided me through my cancer journey with great skill and care. So, I want help others who are undergoing cancer treatment and whose outcomes are not as positive as mine. To do this I'm taking on the 3 Volcanos challenge in September with your help and support. You can follow my progress, training and fundraising on my JustGiving page and on my blog Lil Sonny Sky. The Yorkshire Cancer Centre at the St. James's institute of Oncology in Leeds is the biggest purpose built cancer centre in Europe. The Moneys you donate will go towards specialist equipment, research and development, patient comfort and support." So, the bottom line, if you have any spare money at all, there are two ways you could help fight cancer and sponsor Lisa's incredible challenge…you could treat yourself to a fantastic print (only £20) or if you don't have that much you can donate any amount on Lisa's JustGiving page, no matter how small. Go on, give a quid. I'll get down off of my soapbox now…Thank you!